Westfield, Indiana was founded by Quakers in 1834. The Quakers came out of North Carolina to settle. They protested southern slavery, and the small town became a point on the Underground Railroad. It was incorporated as a town in 1848, and incorporated as a city in 2008. The city is located in Hamilton County and has an approximate population of 34,000. The historic city lies 10 miles from northern Indianapolis. One of the most popular things in this historic area is the Grand Park Sports Complex. Year-round events are held at this 400-acre park. There are 10 miles of trails for walkers and those who cycle. Sports lovers will enjoy the 31 multipurpose fields, the 26 softball and baseball diamonds and the indoor soccer fields. There is also an indoor facility for basketball and volleyball. MacGregor Park also offers paths for walking or running. It is surrounded by shade trees where you can settle to rest or meet with friends and family. If you want to experience wine tasting in a beautiful setting, the Urban Vines offers not only a tasting room but a patio that looks out over the vineyard. On the weekends, live music can be found on the patio. Ice skaters will enjoy The Arctic Zone, which hosts public skating, hockey training, and lessons for all levels of skill. Golfers will want to check out The Wood Wind Golf Club, an 18-hole course that is considered one of the best in the U.S. History lovers will find many exhibits on the Underground Railroad at the Westfield-Washington Historical Society and Museum. With antique photographs, period artwork, as well as artifacts, the 19th Century daily life is represented. Shoppers will enjoy discovering the unique shops and an assortment of businesses. The diverse real estate in Westfield is a reflection of the history and the growth of this thriving city. You will find older neighborhoods with a mix of ranch and turn of the century type homes. You’ll find neighborhoods of amazing custom homes and condos. Some of the elegant new homes were inspired by Victorian architecture. There are also bungalows and multi-story homes. Residents have commented it is the best of two worlds, city and country. The yards are large, and there are lots ready for new homes to be built. Even though it is growing, it has that small-town family-friendly atmosphere. The school system is rated highly, and there is a low crime rate. 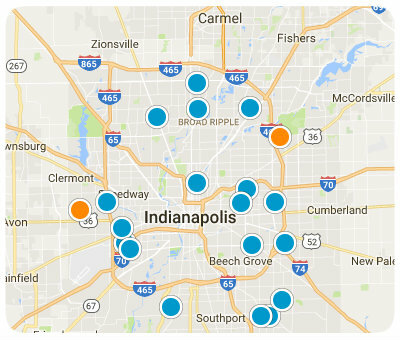 With the variety of local amenities and the proximity to Indianapolis and all it offers, this is a must-see destination for home buyers in the Indianapolis area. If you would like more information on homes for sale in Westfield, Indiana, please contact us today and allow us to assist you. Listing courtesy of Priority One Realty. Listing courtesy of Urban Space Residential. Listing courtesy of Liz Foley Real Estate, Inc..